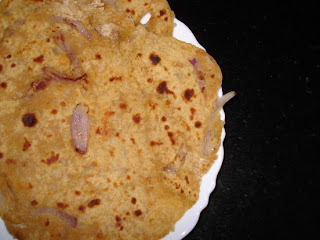 Cooking 4 all Seasons: Parathas from Leftover Rice! I don't really remember eating much of leftover stuff at home more because Amma used to prepare all three meals and there was always somebody to complete whatever was left. Parents have strong opinion against having food stored in fridge and consuming it later. No there is no question of leftover items at home. But off late due to hectic schedules and kids, hubby dear suggested that I could cook for two days and store it immediately in the fridge for the later consumption. Well followed it for a week, but got bored and also felt guilty that I wasn't feeding the family properly. Since one month the only dish that I had prepare in bulk and stored was Paneer Butter Masala which my daughter is so fond of that she asks for it everyday. So I tried preparing for 2 or 3 days and stored in separate containers and gave it after heating it. She loved it and wanted me to do it every week. But I have again stopped doing it as I saw that she wasn't eating any vegetable or anything nutritious other than this. Coming on this topic of cooking with leftover stuff for breakfast, it was just that morning I heard my colleague tell me that she prepared parathas with leftover rice. And read that Nandita wanted us to prepare something with leftover item. Well since we don't eat rice during night, there won't be rice left over for breakfast. So prepared this with the rice that was cooked for the lunch. It was very yummy! Just like all my stuffed parathas that I make. 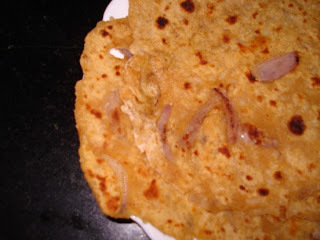 Now we have found one another yummy stuffed parathas. In bowl, take the rice and mash well with hands to make it soft. Then add atta and mix well so that they crumble. Then add all the masala and onions that are sliced finely. This way onions stick to the dough. Then add water little to make a soft dough. Heat a tawa, once its hot apply oil and spread this to it. Cook on both sides with oil. Enjoy with any side dish. Goes well with just Pickle and curd. The other items that can be prepared from leftover rice are Chitramma, Pulihora, Biyam Vadiyalu, Ragi Mudda and Fried Rice. Ragi Mudda is the most common breakfast that Athamma prepares if she has lot of rice left over the night. Sending this to Nandita of Saffron Trail for her event WBB which is on Leftovers this month.